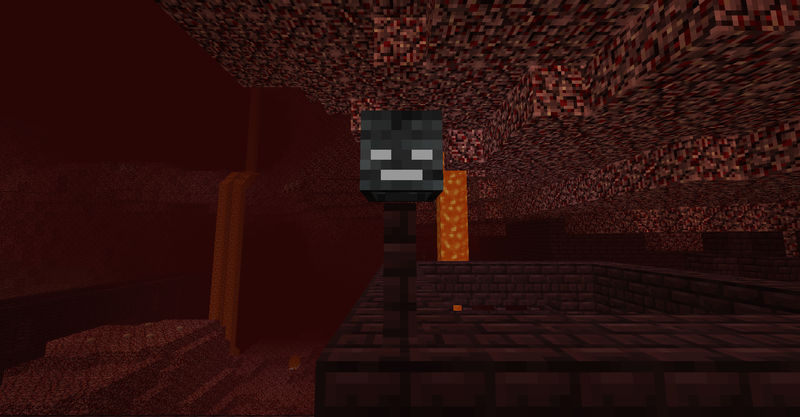 Wither skull turret-like objects can rarely spawn on parts of Nether Fortresses that are exposed to open space, usually no more than 2-3 per fortress. They would look something like the below image (although bigger and more visible), with eyes that glow in the darkness when they detect a target. They fire Wither Skulls every 5 seconds at the player and any other non-Nether mob within 48 blocks of it, prioritizing whoever is the closest. The skulls have the same speed and damage as normal Wither Skulls; however they don't damage any blocks. Hitting the turret with an arrow or trident damages it and causes it to fire slower blue skulls that can be reflected back, but also makes it invulnerable to other arrows/tridents. The turret can be deactivated by an explosion, reflected skull/fireball or melee attack, which turns it into a regular wither skeleton skull that can be collected. Alternatively, hitting it with a skull/fireball only temporarily deactivates it, and to destroy it for good you have to break the block under it instead. This could be a rare and non-renewable source of Wither Skeleton skulls, as well as a sort of "ranged defense" mechanism for the Nether Fortress. I like this concept a lot. However, it might make wither skulls to easy to get. How about instead, there's a 5% chance of dropping itself? 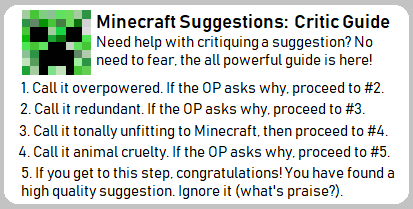 The original intention for the drop was for it to help you in summoning your first wither (in case you haven't gotten any from skeletons), but a reduced drop chance could also work. In that case the turrets could be more common than 1-2 per fortress, but not common enough for their ranges to overlap (so you won't have to deal with 2+ turrets at the same time). This is a pretty nice concept, I do feel getting the skull 100% of the time might be OP, but I can't give a firm opinion since I don't play much survival. I give this suggestion support and a pet rock. I'm a Whovian squid who likes drawing. I'm also quite nerdy with an interest in game developing and the concept of a fourth spatial dimension.